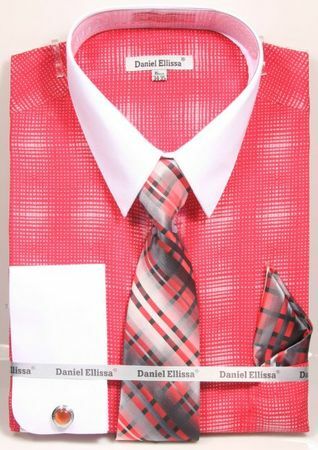 You won't stop believing in style when you wear this coral plaid with white collar dress shirt tie set by Daniel Ellissa. Daniel Ellissa is the primary brand that makes dress shirts that have fun to wear colors and patterns and have matching tie sets. This coral pattern dress shirt has a plaid like fabric with contrasting white collars and french cuffs that just look like style. The matching tie and handkerchief set is just the finishing touch. Made of cotton blend fabric.